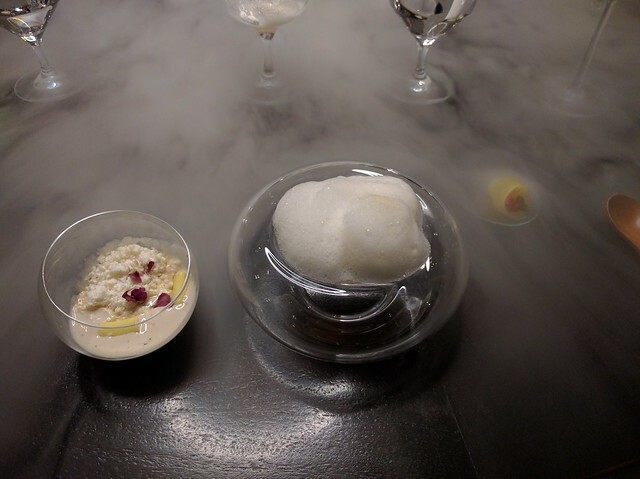 Living in the Bay Area, I had heard of Alinea a few times but since I never had a reason to go to Chicago, I never investigated it as a destination restaurant like the Fat Duck. In fact when I did eventually go to Chicago for the first time we made a special trip to Moto instead since I was a big fan of Homaru Cantu’s Iron Chef episode with Morimoto. 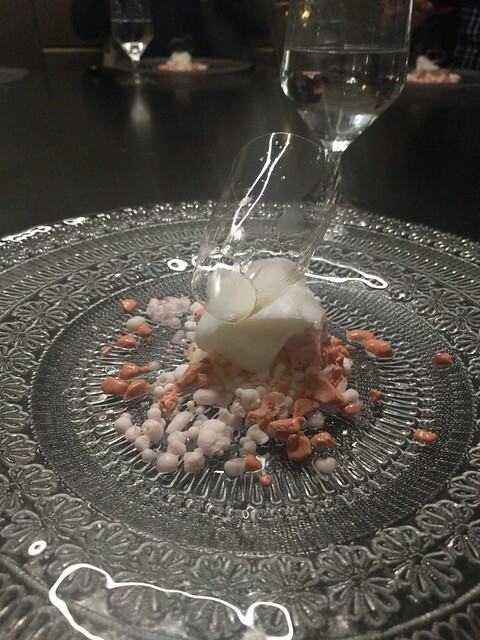 All that changed when I saw the Grant Achatz episode of Chefs table and Alinea instantly went to the top of my list based on its presentation alone. 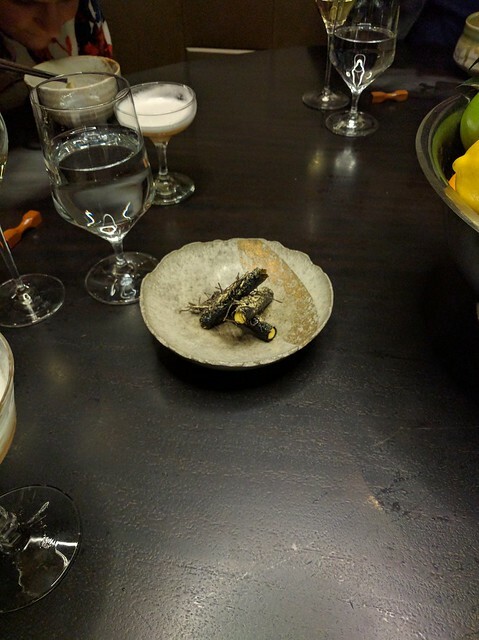 It took several months but I was finally able to get a group of 6 California friends willing to fly out to Chicago and do the full Alinea Kitchen Table experience on a cold night in December. 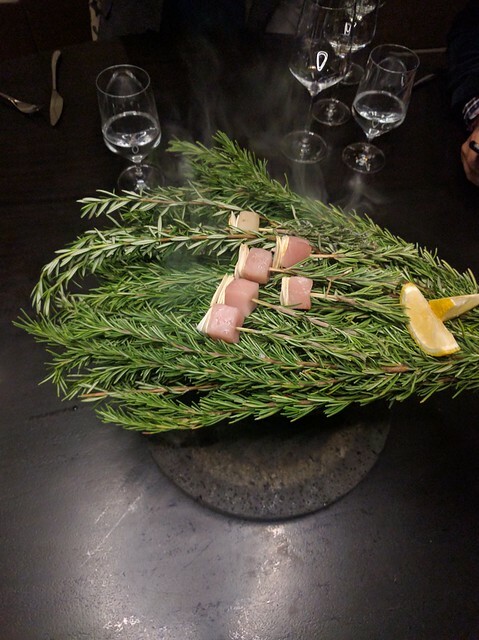 The following is my review of the Alinea experience though I would suggest that if you are going to visit any time in 2017 you should not read this review and instead go experience it with fresh eyes. Having already seen some of the dishes on Chefs Table took away some of the wonder I would have felt if it would have been completely fresh. 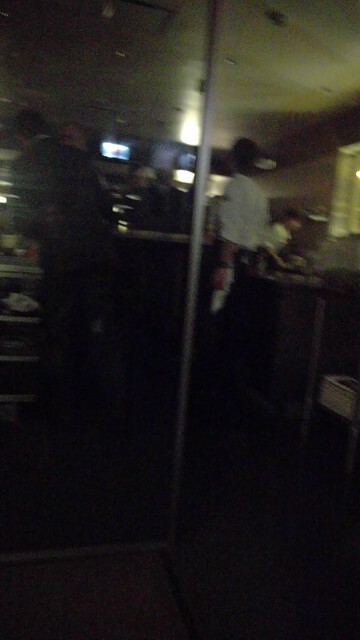 Once you enter the restaurant you are immediately taken through the length of the restaurant and into the kitchen which has a booth at the end which one glass wall that allows you to look into the kitchen at all times. The food for the first course is already plated at the candle-lit table and while you normally could choose your seats, in our case Nithyas position was already marked since she was doing the vegetarian menu. Unfortunately this meant that the two of us were with our backs to the kitchen which was pretty annoying since I’m pretty sure that of all the diners I would have spent to most time watching the food prep process. The first course is named Ice and consists of small servings of 5 different toppings that we could spread onto some lightly toasted brioche. The 5 items were black truffle paste, king crab, pearl onions, Osetra caviar and egg “salad”. My favourite item was definitely the black truffle past which was quite an explosive way to get started. 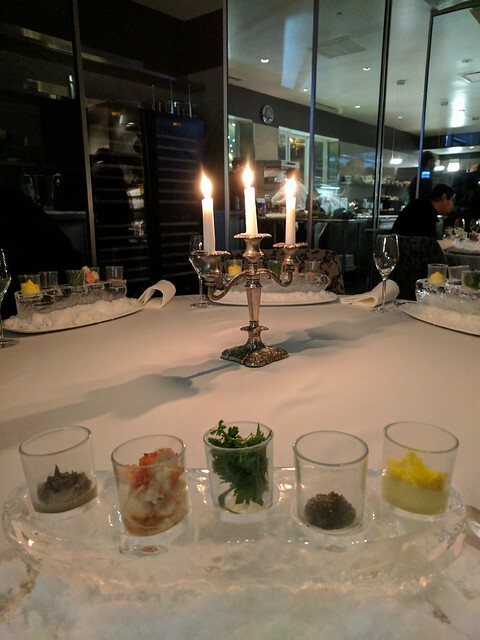 I also really liked the presentation where you got to chose how the meal started which sets a tone for a meal in which the rules could be broken at any time. 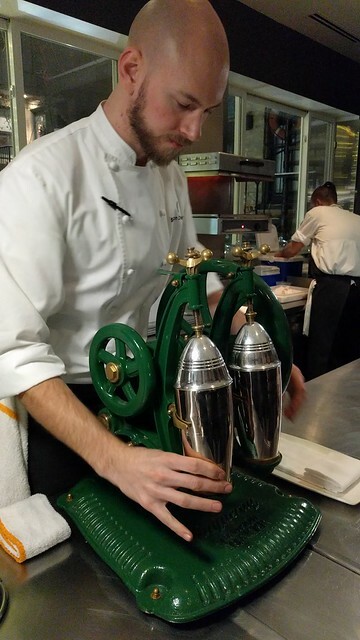 After the first course you are escorted into the kitchen itself where one of the chefs uses an old fashioned mechanical shaker to create an egg white foamed Quince cocktail which is served with a parmesan donut. While this course is going on the staff are quietly reconfiguring the dining booth by removing the candles and tablecloth and adding a large central fruit bowl to give it a more modern look. It is a bit of surprise to come back and find the table looking completely different. The next dishes are Paper and Crunch which are served together. 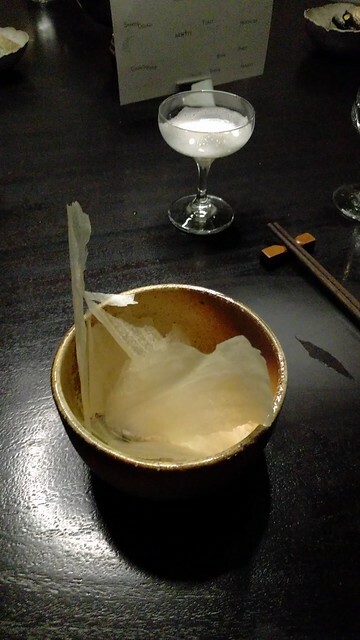 The Paper course above consists of scallop “paper” in a bowl which is then filled with corn broth to make a scallop soup of sorts. the corn theme also continues into the crunch dish below which is a nori cylinder filled with a cornbread puree. A great way to play with textures together and I especially liked how the paper becomes almost egg drop like in the broth. We were wondering why they had placed a fruit bowl in the middle of the table and got our answer in this course. 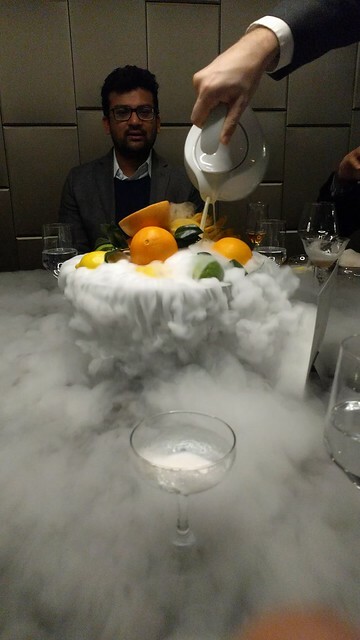 The server comes by and pours some liquid nitrogen into the citrus bowl which causes it to spill over with a citrus “fog” of sorts that brought a great smell to the table. Was reminiscent of the forest course from the Fat Duck. As the scent is still going over the table, we are presented with our first compound course: Contrast, España and Swirl. Contrast was pears and paprika in the center, España was Iberico ham on the left while Swirl was yuzu with lemon. 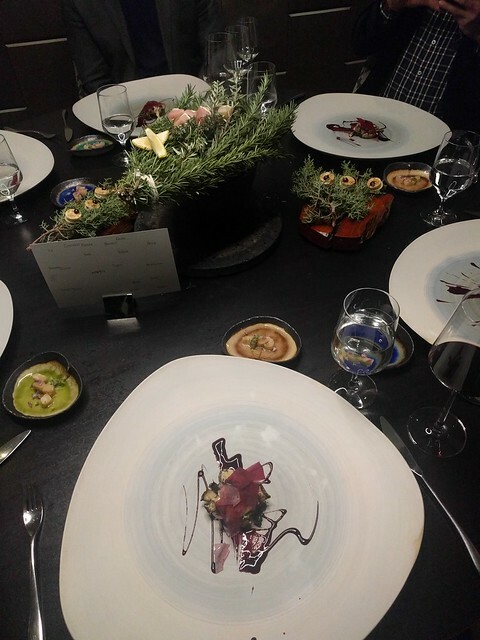 My abiding memory of this course was that the glass dish in the center was extremely difficult to eat off of. 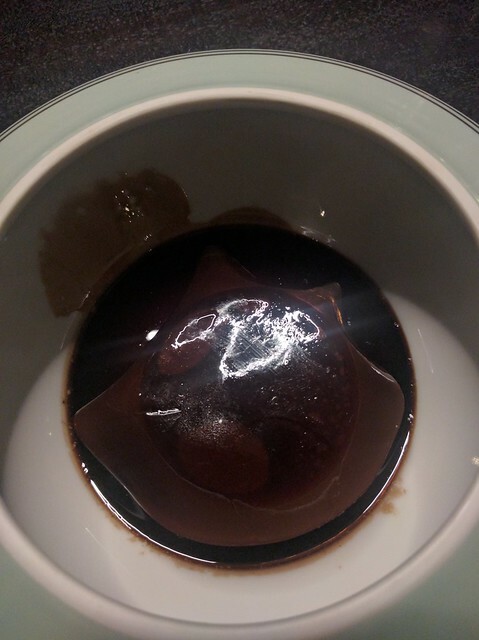 It was extremely shallow and I couldnt really get a decent spoonful. Swirl was a super refreshing mouthful to end with. The next dish was one of my favourites because it was an unexpected trip to southeast asia. Called simple “Coconut” it consisted of pompano in shellfish/kuzu broth served with sprouted coconut. The effect was enhanced by serving the dish in a coconut shell nestled in curry leaves to give it great scent as well. Reminded me of a thai curry and again confounds expectations. 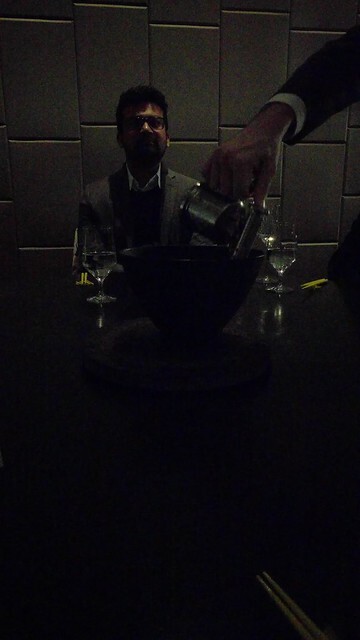 We then got to a mood setting course where the room lighting darkened and they lit a fire in a metal bowl on the table. A few minutes later (and still in the firelight) we were served the “yellow” course in a special flexible plastic plate that was perfectly shaped to fit on your left hand. To go with the yellow theme we got crispy pork belly with yellow curry sauce and banana. We then moved on to the next compound serving of the dishes: Steam, Glass and Branch. The steam course begins with pouring a little water into the fire bowl that was lighted in the yellow course to put out the fire. 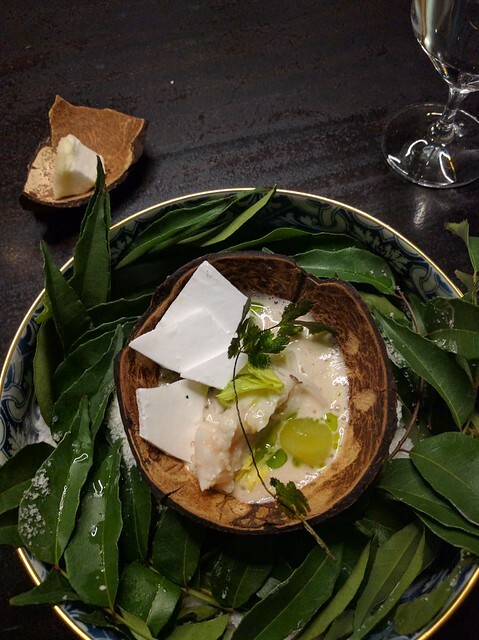 The bowl is then covered with these large branches of rosemary which include a few individual sprigs that have been spared through some raw hamachi tuna and matsutake mushroom. We then wait a few minutes as the heat from the bowl steams the fish tableside while the rest of the food is brought out. Glass is a fascinating presentation where the purple sheets are blueberry glass served with maitake mushroom and Lapsang Souchong tea over a blueberry and foie gras sauce. 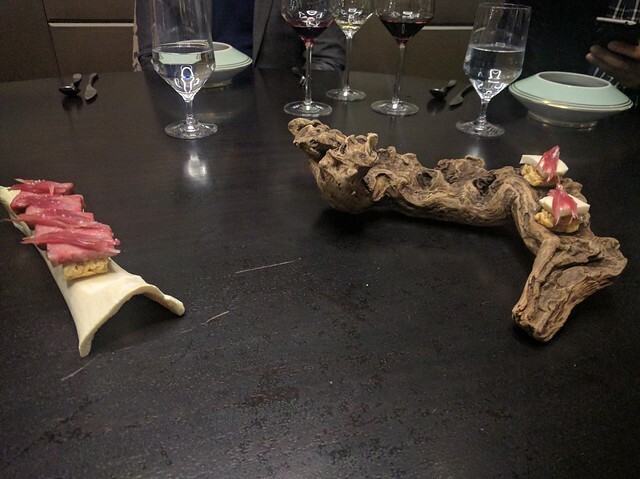 The full presentation is shown above where the “Branch” dish consists of a mastic chip with some grape jelly. It is also served with some maitake mushroom on the side as well. The next course was my favourite of the entire mean. Its simply called Toast and consists of pumpernickel toast topped with gruyere cheese and a generous disc of black truffle. 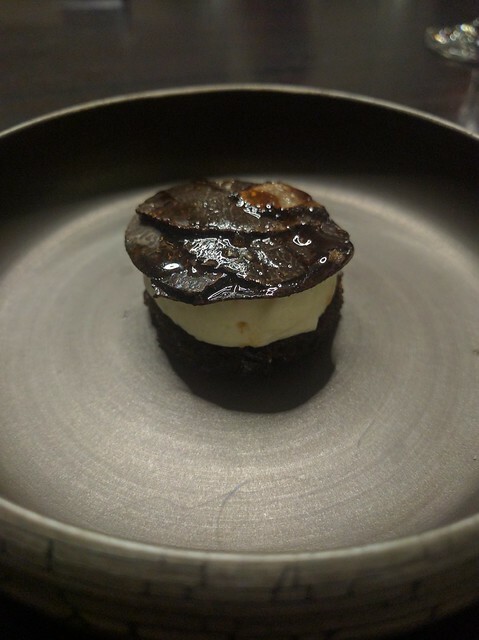 Its hard to describe but eating it felt like a brain freeze where instead of cold all you could feel was truffle. 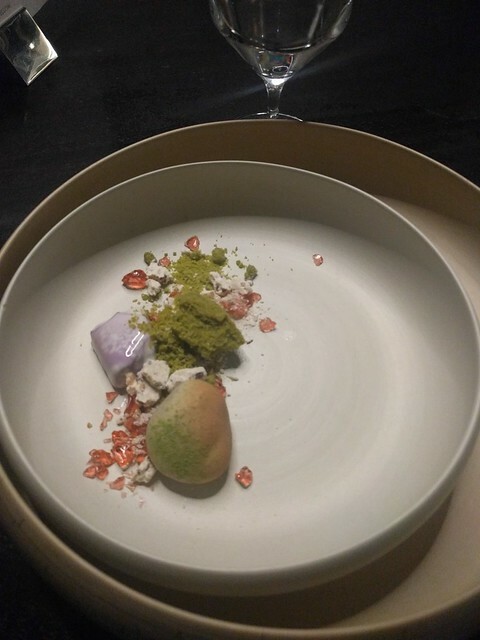 A truly unique dish and experience that I may never feel again. 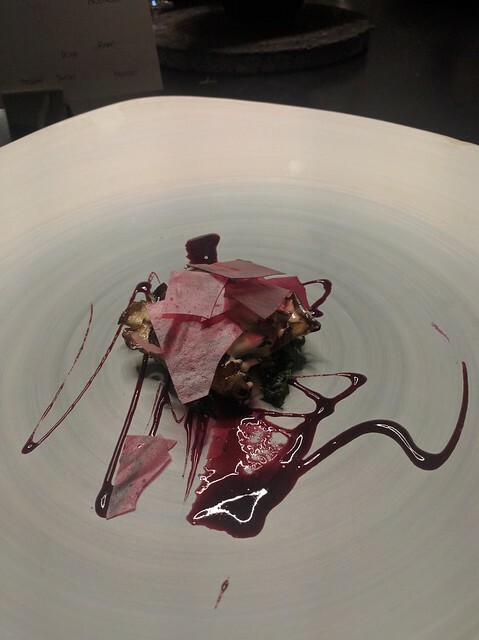 Smoke consts of Short Rib beef with Cocoa and Cassis, served under a blackberry gel. While the beef was indeed prefectly cooked, I felt that it was just a little too sugary and heavy, plus I really did not like the serving dish which had a pronounced overhanging lip that made it hard to get the blueberry gel along with the beef. The bone course was another one my favourites and consisted of wagyu beef on a crispy rice craker – much lighter and really showed the quality of the meat. The next dish was named Nostalgia and based around the concept of a kids birthday party. The cutlery used even looked like plastic despite being high quality metal stuff. They start of by serving some cake along with bubble gum ice cream. 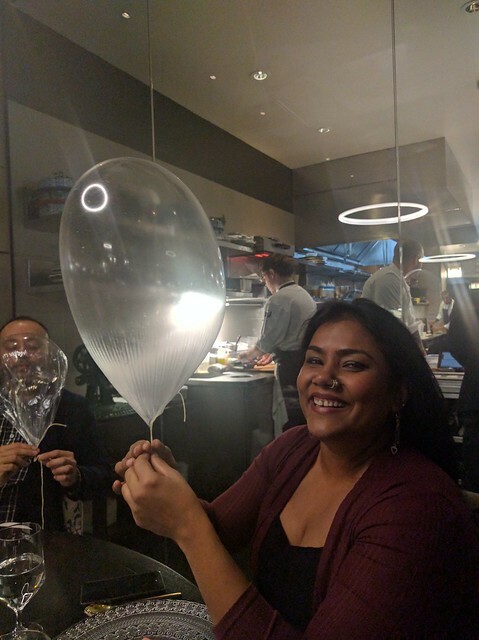 Once you are done with the cake the chefs come by and give each diner this fantastic floating balloon made of banana taffy and filled with helium. This is the frankly the most amazing presentation I have ever seen and you should watch the chefs table episode to learn more about how they actually created the dish. The taffy itself was nothing special but the idea of eating a ballon at a birthday party is just mind boggling creativity. 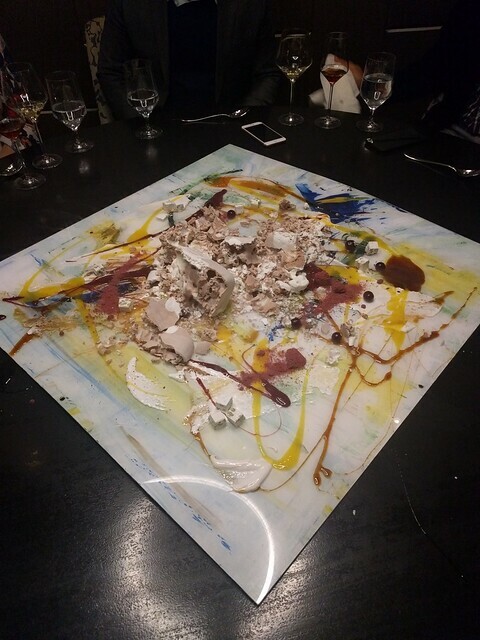 The next dessert was named “Paint” and was the piece de resistance of the whole dinner experience. 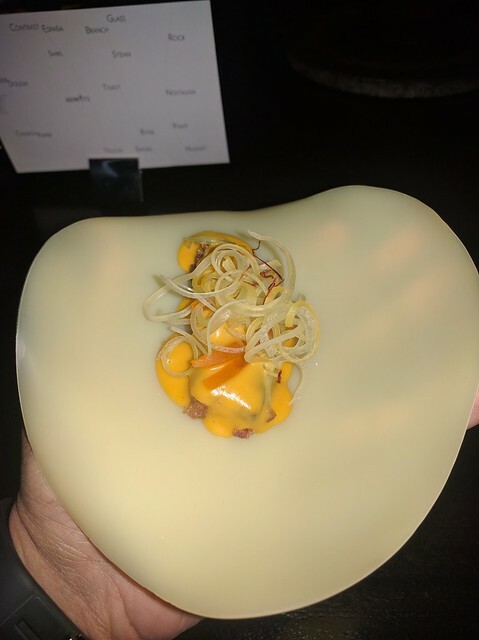 Alinea is famous for having one of the dinner items be in full view throughout the meal only to be suddenly pulled out and used for a specific dish. We looked around when we got in but didnt see anything obvious around the table but it ends up the the answer was on the ceiling. There was set of 7 paintings hanging from the ceiling which you expect to be paint on canvas but it ends up that one of them was paint behind clear acrylic and was brought down to be the canvas for the course. Sit back and watch the fun! 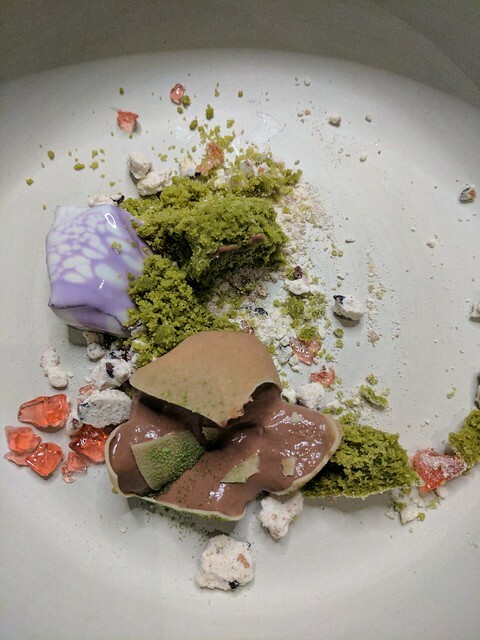 The ingredients in this course were frozen mousse (final brick), pistachio nougat (white), sour cherry (red), Orange Peel (yellow), Coffee and Molasses (brown). You got to essentially make your own dessert from this set of ingredients and we made quite certain to finish it all. An amazing interactive presentation and was super fun despite the fact that we knew that it was coming. 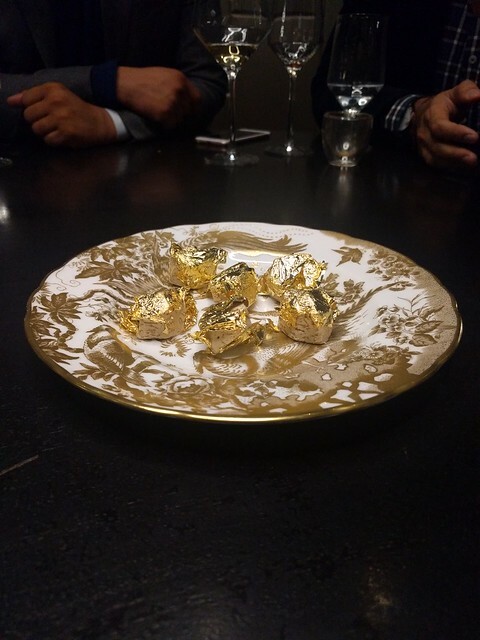 We finished the meal with some nuggets of sesame and brown butter wrapped in gold leaf. 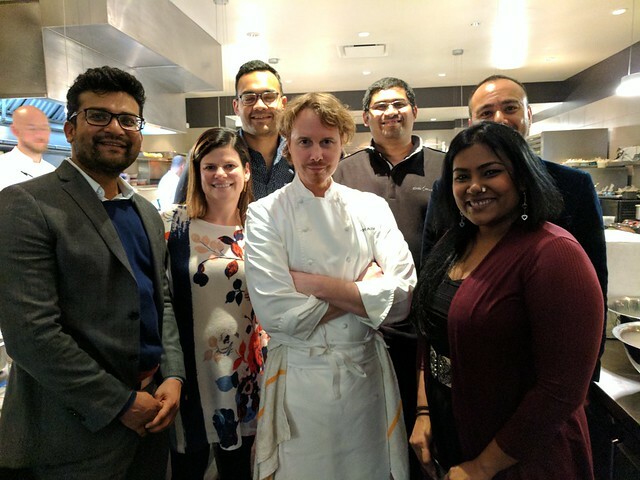 And chef graciously allowed us to take a picture with him in the kitchen and also autographed our copy of the Alinea book that we had brought with us from SF. All in all it was a super interesting meal with great flavours but where it really scored was in presentation and creativity. There were a couple of “meh” courses but if value an “interesting” meal then the kitchen table at Alinea is definitely the place to go. I will certainly go back some day but probably in a few years after they have revamped the menu and this time I will make certain to avoid spoilers before the meal. 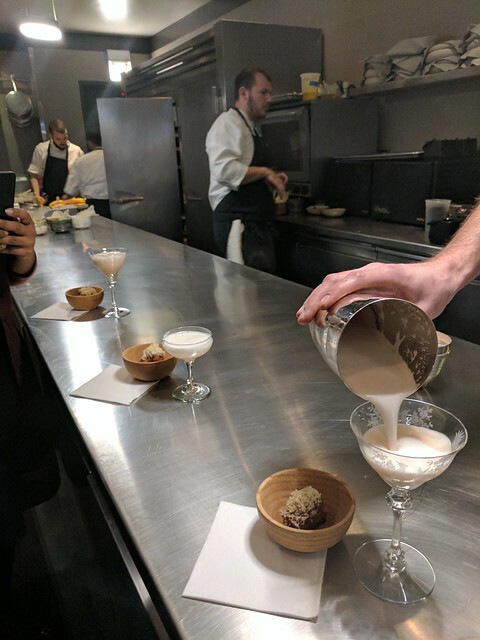 This and the Fat Duck are definitely the two most unique dinner experiences I have had and I highly recommend them both.